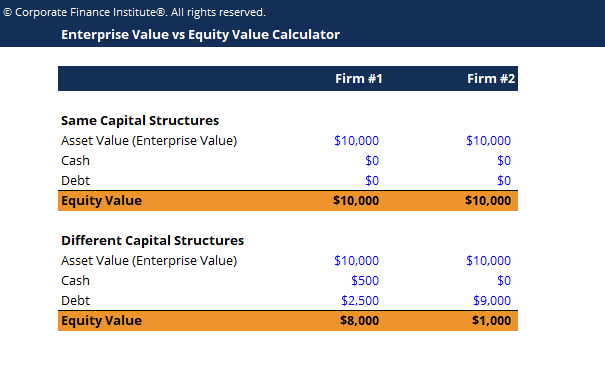 This enterprise value vs equity value calculator will allow you to compare the equity value of two companies with the same enterprise value but different capital structures. The enterprise valueEnterprise ValueEnterprise Value, or Firm Value, is the entire value of a firm equal to its equity value, plus net debt, plus any minority interest, used in valuation. It looks at the entire market value rather than just the equity value, so all ownership interests and asset claims from both debt and equity are included. (which can also be called firm value, or asset value) is the total value of the assets of the business (excluding cash). When you value a business using unlevered free cash flowUnlevered Free Cash FlowUnlevered Free Cash Flow is a theoretical cash flow figure for a business, assuming the company is completely debt free with no interest expense. It's used in financial modeling to calculate a company's enterprise value. The formula = EBIT - Taxes + Depreciation & Amortization - Capex – Change in Working Capital in a DCF modelDCF Model Training Free GuideA DCF model is a specific type of financial model used to value a business. DCF stands for Discounted Cash Flow, so the model is simply a forecast of a company’s unlevered free cash flow discounted back to today’s value. This free DCF model training guide will teach you the basics, step by step with examples and images you are calculating the firm’s enterprise value. Where EV equals Enterprise Value. The equity valueEquity ValueEquity value, commonly referred to as the market value of equity or market capitalization, can be defined as the total value of the company that is attributable to shareholders. To calculate equity value follow the examples and step-by-step instruction in this straightforward guide from CFI. (or net asset value) is the value that remains for the shareholders after any debts have been paid off. When you value a company using levered free cash flowFree Cash Flow (FCF)Free Cash Flow (FCF) measures a company’s ability to produce what investors care most about: cash that's available be distributed in a discretionary way in a DCF modelDCF Model Training Free GuideA DCF model is a specific type of financial model used to value a business. DCF stands for Discounted Cash Flow, so the model is simply a forecast of a company’s unlevered free cash flow discounted back to today’s value. This free DCF model training guide will teach you the basics, step by step with examples and images you are determining the company’s equity value.